For over a century since their creation, traditional, diamond shaped bicycle frames dominated the industry and remained almost unchanged. In 2010, however, Italian-born inventor Lucio Tortola had a simple yet industry-changing idea. What if a new, more efficient, more reliable, more comfortable and more attractive frame for bicycles could be developed? In answer to his question, Mr. Tortola made an invention – a circular bicycle frame – that promises to revolutionize the cycling industry. In order to commercialize the groundbreaking idea, the entrepreneur established a company called RoundTail Bike (RoundTail) – also operating as Tortola International Inc.
Intended to capture the essence of the bicycle’s frame, the RoundTail brand has resonated with expert and novice cyclists alike and sent waves of interest cascading across the cycling world. The idea to create the RoundTail bike first came to Mr. Tortola following a long cycling season in 2010 covering 5,000 kilometers (km). With over 20 years of cycling experience, the inventor noticed that some of his cycling partners suffered from fatigue and discomfort following extended rides using bicycles with traditional diamond frames. Spurred on by a desire to create a more efficient cycling frame that is moreover comfortable, Mr. Tortola, who is a designer and engineer-technician by training, went home one evening and began making the first sketches of his new idea. Soon thereafter, the circular bicycle frame was born. The entrepreneur’s invention represents a step change in the state-of-the-art in bicycle construction. Before the RoundTail bike, conventional diamond frames supported a straight line tube that extends from the bracket (where the pedals are) through to the seat. This configuration provides little protection from shock waves that emanate from the road, up through the straight tube of the frame, into the seat and through to a rider’s spine. Hence, many cyclists have suffered a variety of discomfort and injuries (including back pain) from cycles with diamond frames. By contrast, the RoundTail frame – which is made of two parallel rings that are splayed open towards the bottom bracket and back of the bicycle and connected at the top where the rider’s seat is located – dissipates energy from the ground along its curved structure. The result of the RoundTail frame is increased comfort for the cyclist without loss in sideways stiffness and pedaling efficiency. In addition to improvements in function, the RoundTail’s curves aid the aerodynamic efficiency of the bicycle while creating a shape that has become a hit with many cycling enthusiasts and customers. From the beginning, RoundTail’s founder was eager to establish a reputation for quality via collaboration with established industry partners. With a computer-aided prototype sketch in hand, Mr. Tortola sought the expert advice and creative skill of a well-known custom frame builder in Bozeman, the state of Montana, in the United States of America (USA). Five months later, the inventor had a fully built and functioning prototype. Thereafter, Mr. Tortola took the frame for proof of concept (PoC) testing at Microbac Laboratories Inc. (Microbac), an established company that carries out product testing for a number of industries including cycling. At Microbac, the RoundTail frame was successfully tested for horizontal and vertical loading durability and impact strength. In addition, Finite Element Analysis (FEA) modeling – which measures the stiffness of complex structures – was carried out at the lab. The FEA procedure showed that the RoundTail frame had 10 times the vertical flexibility and over 60 times the shock absorption capability of traditional diamond-shaped bicycle frames. Along with shock absorption and durability, the new frame retained lateral stiffness – a prerequisite for efficient pedal power and cycling speeds (excessive shock absorption would reduce speed which would disadvantage road cycling racers). Moreover, although the RoundTail was found to be slightly heavier than traditional frames (by approximately 250 grams in some instances, depending on the materials used), the marginal costs of the new frame were outweighed by its overall benefits. Other tests were carried out on the RoundTail including real-world tests when two cyclists rode a bicycle fitted with the new frame over a variety of smooth and rough terrain. These cyclists provided important feedback – such as the level of vibrations felt in the backs and arms during such rides – which was compared against tests where the rider used a traditional, diamond frame cycle. Results showed that no discomfort was reported after riding the RoundTail for approximately 80 kms, whereas some discomfort was reported after riding bicycles with diamond-shaped frames after only a few kilometers. Having completed comprehensive PoC testing for the new frame, the inventor followed his Italian roots and outfitted the prototype frame with components manufactured by Campagnolo srl (Campagnolo) – a renowned manufacturer of high-end bicycle parts based in Vicenza, the Italian Republic (Italy). Mr. Tortola also visited Campagnolo directly and received excellent feedback and support from the company. By 2011, three RoundTail frame models were handmade in Bozeman and fitted with parts created by Campagnolo. To develop the RoundTail frame for the mountain bike (MTB) model, furthermore, the company has collaborated with other established partners including Shimano Inc., a cycling components manufacturer from Japan, and Sram, a bicycle parts maker from the state of Illinois, the USA. Also in 2011, three more RoundTail bike models – inclding the 26” and 29er series – were made in the People’s Republic of China (PRC). A high-end titanium frame was also constructed by Lynskey Performance, a renowned manufacturer of titanium bicycle frames based in Chattanooga, the state of Tennessee, USA. Furthermore, the company’s bicycles satisfied the requirements of the American Society for Testing and Materials – an international organization that sets the standards for materials, products, systems and services. 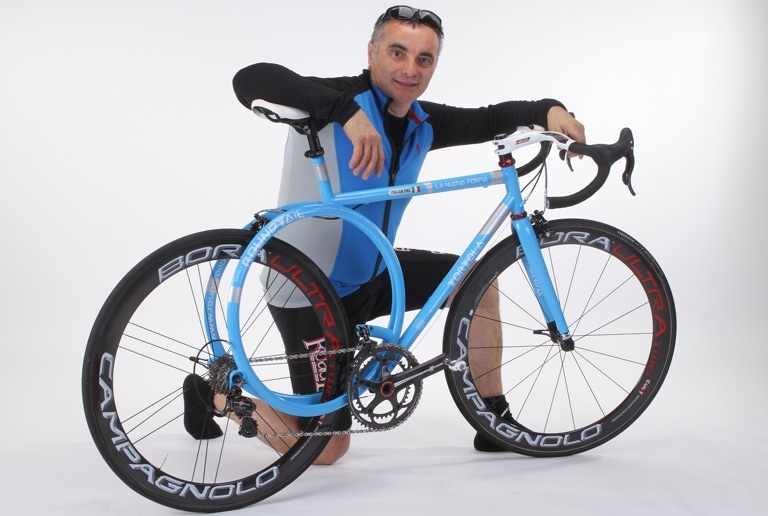 In order to attract new customers and investors, RoundTail has worked with established industry partners while developing a number of bicycle models based on quality and the company’s Italian heritage. Apart from the RoundTail brand itself, the company has labeled all of its innovative bicycle frames with two logos: “Italian DNA” and “Tortola” – the latter word being a match for the inventor’s last name while the former pays homage to the company’s and inventor’s Italian roots. Moreover, RoundTail has relied on a variety of multimedia outlets, industry events and famous personalities in the cycling world in order to raise brand awareness and increase commercialization opportunities. One of the company’s earliest collaborations was with Steve Boehmke – a mountain biking hall of fame member and early pioneer in the sport. Working with Mr. Boehmke, who is also a public relations consultant, the company was able to establish contacts in the industry and arrange promotional interviews and awareness-raising campaigns with cycling related publications. Furthermore, Mr. Tortola has utilized a number of media outlets in order to promote the company via interviews on radio (including AM800CKLW, a broadcaster in Windosr, Ontario) and for established magazines including the Los Angeles Times and Mountain Bike Action Magazine. Commensurate to promoting its brands through a variety of media, RoundTail has attended industry events where the company’s products have been showcased in specialized stands. In 2011, the company’s bicycles were presented at Interbike – one of the largest annual gatherings of bicycle enthusiasts and companies in North America. The company has also promoted its unique bicycles in neighborhoods with a high following of cyclists such as Delray Beach, the state of Florida, in the USA. During such events, Mr. Tortola has been able to meet and greet customers and explain the inspiration and method behind the RoundTail invention. In addition, the company has relied on its professional corporate website and utilized a number of Internet based tools, including social sharing and networking services such as Facebook, Twitter, LinkedIn and YouTube, in order to raise awareness of its brands, products and activities. The company’s Facebook page utilized an application that can be downloaded – called “WinRoundTail” – through which participants could share information with others about the company and enter a competition to win the distinctive bicycle. Via its YouTube channel, moreover, RoundTail not only show-cases its bicycle’s functionality; it also markets its products via positive personal testimonies and endorsements by consumers. Such strategic use of Internet-based and other marketing tools has raised the company’s profile internationally while allowing it to interact with potential and actual consumers from around the world. As of 2012, RoundTail’s products were available in a variety of materials (including titanium and carbon fiber); three colors (white, light blue and black); and a number of models (such as MTBs, road bikes and hybrids). In the same year, the company created bicycles for advanced cyclists and beginners which were commercialized in Canada, the USA and, increasingly, other international markets. Since the company’s establishment, Mr. Tortola, who has inventions in other fields, has been keen to protect the intellectual property (IP) rights of his designs and brands. With his ideas protected via the IP system, the inventor has entered confidently into new markets in several regions and countries. In order to protect the company’s brand in the potentially lucrative USA market, the bicycle maker registered Roundtail (2012) as a trademark via the United States Patent and Trademark Office (USPTO). In the same year, Mr. Tortola filed a design application for the company’s unique frame via the International Design System (the Hague System) managed by the World Intellectual Property Organization (WIPO). RoundTail, furthermore, filed patent applications for a bicycle frame via the Canadian Intellectual Property Office, the USPTO (2010) and the Patent Corporation Treaty (PCT) System managed by WIPO. By establishing a robust IP rights strategy, Mr. Tortola has secured his ideas and newly famous brand while ensuring important company assets that can be leveraged in negotiations with partners – such as large bicycle manufacturing companies – or prospective investors. Parallel to the company’s trademark, patents and design registration, RoundTail retains two domain names (roundtail.ca and winaroundtail.com) in order to enhance its corporate profile on the Internet. Within a few years since it was established, the RoundTail brand has shaken up the cycling industry and developed an international following. As a measure of the impact the company has had on the industry, in 2012 RoundTail’s design was inaugurated into one of the USA’s most prestigious institutions – the Bicycle Museum of America, based in New Bremen, the state of Ohio. In the same year, the company was represented at Expobici, an exhibition of cutting-edge industrial design for public transportation held in Padova, Italy. At the event, the Carbon Diamante RoundTAIL bike won a distinction award in innovation (in the “road” category) while the Pinarello Dogma MTB model won an award in the design section. RoundTail’s product portfolio includes high-end, custom-made bikes (selling for approximately US$7,000); medium-range bicycles (selling for approximately US$3,000); and mass-produced bikes (selling between US$800 and US$1200). For decades, bicycles relied on the traditional diamond frame until Mr. Tortola decided to challenge the status quo with a new, circular design. The inventor quickly sought expert partners in order to develop his idea and enter a competitive and international market. Basing his company’s expansion on a strategic branding and commercialization plan that was supported by IP assets, Mr. Tortola has been able to commercialize his idea and enter potentially lucrative collaborations with established partners in the industry. The RoundTail brand, meanwhile, has brought new excitement to cycling while enhancing functionality, form and comfort.